Scintillating Black Diamond Swarovski Crystals add sparkle and mystery when combined with a sterling silver Moroccan inspired chandelier setting. So versatile, you'll never want to take them off! Sterling silver fishhook ear wires. Total length is just under 2.25 inches long. 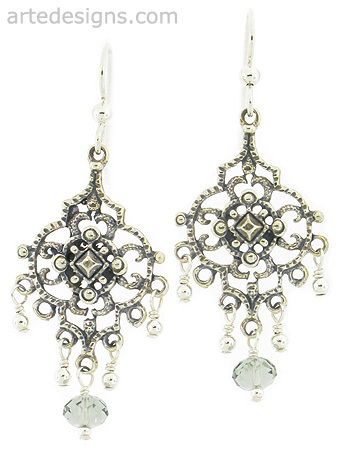 Arte Designs chandelier earrings are fun and affordable. I've made a variety of chandelier styles in different widths and lengths. These shimmering waterfalls are all lightweight, very comfortable, and they flow effortlessly. This handmade beaded collection includes gemstones, crystals, and pearls wire wrapped in sterling silver or gold filled. A great handcrafted gift for you or someone special.